Entering the former Fellows Gear Shaper building in Springfield, Vt., feels a bit like approaching a fortress. The enormous factory, which once employed thousands of people, sits along the edge of the Black River. To get to its front door, you have to cross a long walking bridge, which could easily pass for a drawbridge over a moat. Inside, remnants of the past sit side by side with evidence of the future. From the renovated front entryway, you can peer around to the shiny new Springfield Community Health Center, which will open next fall at the building’s southern end. But turn to the right, and you’ll find the old Fellows office, which looks as if it hasn’t been touched since factory workers left nearly 40 years ago. Brandon artist Patty Sgrecci’s buoyant mobiles hang in the sunlit clerestory. 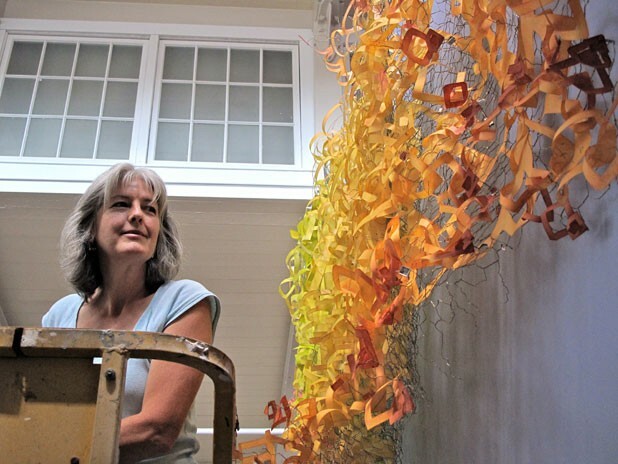 A luminous paper-and-wire installation by Thetford’s Carolyn Enz Hack is mounted high on the front wall. There’s plenty of room to play with Oliver Schemm’s interactive sculpture — as Vermont printmaker Sabra Field gleefully does at the reception, tugging on a bar attached to long metal poles to flip a heavy, gong-like disc. According to Joe Manning, a Massachusetts historian and photographer whose photos of the former factory are included in the exhibit, the Fellows Gear Shaper Company was formed in 1896. Its founder, Edwin Fellows, had developed a gear-cutting tool while working at another Springfield company that designed turret machinery. In 1943, writes Manning, the Fellows Gear Shaper Company employed more than 3300 people — in a town of only about 8000. But the company moved to North Springfield in the 1960s. The town took ownership of the emptied building, which deteriorated over the next few decades. Then, in 2008, John Meekin and Rick Genderson bought the building and planned a multimillion-dollar renovation to transform the complex into a downtown hub. They envisioned offices, restaurants, shops and an art gallery. To that end, last September the pair invited Nina Jamison, who founded Springfield’s Gallery at the Vault — one of the state’s three designated craft centers — and that gallery’s executive director, Melody Reed, to tour the former factory, now known simply as 100 River Street. Meanwhile, Jamison put out a call to artists. She wanted large-scale work to do justice to the expansive space, and sought pieces that fit the emergence theme: “An unfolding flower, a whale exuberantly breaching, the large mural installation with fresh mountain water flowing down from spring melt,” she says. The last image refers to the work of Brattleboro artist Scot Borofsky, who began his career making graffiti in New York City’s East Village. These days he uses spray paint to create meditative Aztec- and Mayan-inspired scenes, often featuring stepped mountains with repetitive patterns that are visually hypnotic. In his five-panel, 84-by-172-inch “The Story of Fresh Water” — one of the most striking works in the Great Hall — five streams of silver water tumble over rows of green, gray and violet mountains, then rise into mist in the valleys. Much of 100 River Street remains unoccupied and eerily frozen in time. During the opening of “Emergence,” curious gallerygoers slipped off into parts of the plant that hadn’t been renovated — massive rooms littered with hulking, dusty machines from another era. Wires and pulley systems hung from gaping holes in the ceiling. In one room, a black letter board — its long-ago messages, presumably to factory employees, made incomprehensible by missing white letters — leaned against a coatrack on the concrete floor. Around it everywhere were rusted old fans, levers, tires and at least one rickety staircase leading up to more monstrous machines. The detritus made for a compelling exhibit all its own. Jamison says the building’s owners are hoping to attract a restaurant to fill some of the riverside space, and there have been discussions about creating an assisted-living facility there, too. Jamison, who has lived in Springfield for 18 years, says it has been a thrill to help bring the building, once the town’s beating heart, back to life. She’s been especially moved, she says, to watch former factory employees get involved. Five of them have volunteered to work as gallery docents through August. “To give these former employees a voice, and the respect they deserve, is a bonus that I was not expecting,” says Jamison.